Kailyn relocated to Raleigh from Charlotte to be closer to her boyfriend, Nick. She loves her dog Luna who is a Boxer/Akita mix. 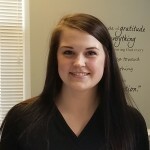 Kailyn says, “Our patients and the quality of their experience are highly important to me. The exceptional atmosphere and level of professionalism at Atlas Chiropractic is something that I value for both the patients and myself.